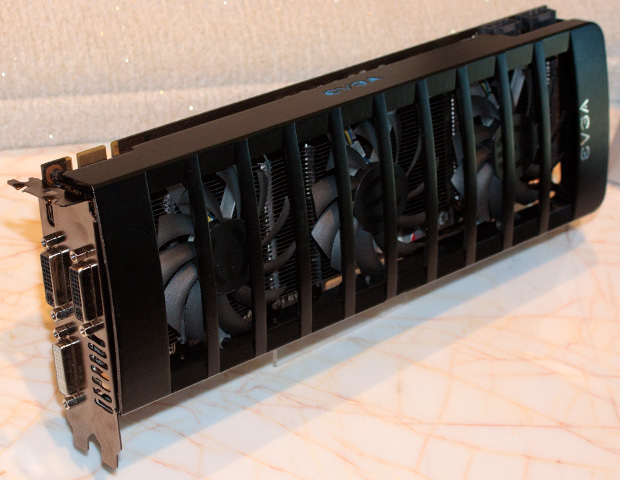 eVGA showed up on CES a dual-GPU graphic card , as everyone know that eVGA is an exclusive Nvidia partner, this for sure must be a Nvidia GTX 500 series card , so this is the first GTX 500 graphic card with a dual GPU . We guess that this is the Geforce GTX 595 Dual-GPU , based on two GF110 cores the card design is quietly ugly with a big heat sink and three eVGA custom made fans and a massive heatpipe cooling system to cool down the two fermi monsters inside , the card has an SLI make it possible to use four-way SLI configuration, the card require eight-pin auxiliary power connectors and we guess that this must be installed with at least a 800W PSU or even more. Also this Dual-GPU card has eight Samsung K4G10325F one-gigabit GDDR5 DRAM chips on the back of the board ,four per GPU so it include at least 1Gb of memory ,the clocks still unknown , about the outputs , there are three DVI outputs on the card, and here thanx to the Surround Gaming that make it possible to play games across them all at once. The price is unknown but don't dream of good price tag for a dual fermi GPU card but if you are an enthusiast crazy you deserve this baby, the release date is for mid-Q1.